FILE - Pakistani Christian woman Asia Bibi is seen after a meeting with the governor of Punjab province at a jail in Sheikhupura, Pakistan. 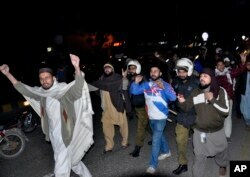 FILE - Pakistani police officers, in helmets, arrest protesters at a demonstration against the acquittal of Asia Bibi, a Pakistani Christian woman who was facing blasphemy charges, in Lahore, Pakistan, Jan. 29, 2019. The mere suggestion of blasphemy can incite mobs to kill. After Bibi's October acquittal the radical Tehreek-e-Labbaik party called its followers onto the streets, where they protested for three days demanding Bibi's immediate execution as well as the death of the judges who acquitted her. The party leadership also advocated overthrowing Prime Minister Imran Khan's government and incited the military against the army chief.